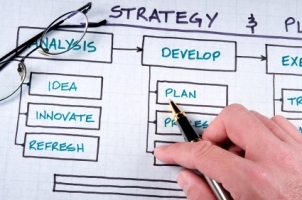 Almost all new businesses need a business plan in order to successfully move from start-up to established business. But a business plan doesn't have to be long or take months to write in order to be a useful tool for small business owners. This exercise provides a quick and painless start to the business planning process by asking you a series of questions about your business, your goals and your future plans. The end result is a streamlined and brief business plan that you can use as-is or as a starting point for a more traditional business plan. Outline the vision you have for your business by answering these questions: What are you creating? What will your business look like in one year, three years, and five years? What is your mission? Why are you starting this business, and what is the purpose? List your overall objectives by outlining your most important business goals, and answering: Are your business goals considered SMART goals? How will you measure success in achieving your goals? Write down your business strategies by answering these questions: How are you going to build your business? What will you sell? What is your unique selling proposition (i.e., what makes your business different from the competition)? What is the total startup capital you will need to launch your business? What do you estimate your business's ongoing monthly expenses will be immediately after launch, in three months, in six months, and in one year? What do you anticipate your business's ongoing monthly income will be immediately after launch, in three months, in six months, and in one year? Create an action plan by answering: What are the specific action items and tasks you need to complete now? What are your future milestones? What will need to be accomplished by those milestones in order to meet your objectives?